Because of Yelp reviews, I knew to head over here through the retail side so that I could get a free sample. When I walked in, yep - I got a milk chocolate truffle sample and was nearly overwhelmed by all the chocolate all around. I didn't actually buy anything though. It was neat to see the displays in the amazing various colors they had. I actually didn't know that Ghirardelli was based in San Francisco until I came into town. Guess I had never looked hard enough at the logo! 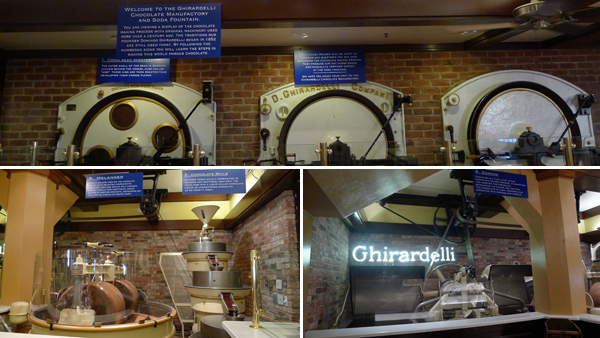 Anyhow, they have a brief machine set-up in the soda fountain area that showed how chocolate is made Ghirardelli's way. It was pretty neat to check out. Duc and I wanted to make sure we got something good here so we ended up choosing the Gold Rush Sundae. I knew he loved peanut butter, so it was the choice. Vanilla ice cream with melted peanut butter, hot fudge, caramel, whipped cream, and a Maraschino cherry on top - how do you not feel guilty about that? However, the melted peanut butter was just a brilliant idea because it really mellowed out the entire dessert. Usually peanut butter and chocolate desserts have one overpowering the other but this was just perfect. I'm pretty sure I lost his heart over this dessert - I even caught him at some point during the rest of our day daydreaming about the dessert and not me. Too good - worth the ~$9.